"Independent" New Zealand journalist Julie Webb-Pullman has been a consistent defender of and "apologista" for the "Urewera 17"
Her articles defending and excusing those arrested in in the October 15th 2007 anti terror raids saturate the internet-many via the anarchist linked news site SCOOP. Who is Julie Webb-Pullman? Why is she such a passionate defender of the "Urewera17"? Far from being the independent journalist she likes to portray herself as, Webb-Pullman is a creature of the far left. She is a fawning admirer of Castro's Cuba and a great friend of Mexico's Zapatista rebels. In 19 she was a researcher for a film on the Maoist/Anarchist leaning Progressive Youth Movement-"Rebels in Retrospect." Later Webb-Pullman worked for UNICEF in Fiji. By the early '00s Webb-Pullman was involved in Latin American solidarity work in Brisbane. She worked with the Committee in Solidarity with Latin America and the Caribbean-a front for Australia's largest Marxist_Leninist organisation, the Democratic Socialist Party. By 2004 Webb-Pullman was back in New Zealand using Ministry of Foreign Affairs and Trade money to send New Zealand films to Cuba. February 2004, the Latin America Strategy Fund provided financial support for a New Zealand film festival in Havana as part of Si! Cubanz Filmz, a film festival exchange project organised by New Zealander Julie Webb-Pullman in conjunction with ICAIC (the Instituto Cubano del Arte e Industria Cinematograficos – the Cuban Institute of Cinematographic Art and Industry). The New Zealand films screened (subtitled in Spanish) were The Price of Milk, Don’t Let it Get You, Sleeping Dogs, Utu, Ngati and Once were Warriors. Julie Webb-Pullman of Wellington has raised a series of complaints to the Press Council arising from two articles published in the Lifestyle and Leisure section of The New Zealand Herald on 29 September and 30 November 2004 and a film review published on 18 December. All were by Peter Calder and touched on aspects of life in Cuba. Webb-Pullman was not so negative in November 2007 in this piece welcoming the new Cuban ambassador to New Zealand. All work and no play may make Jack a dull boy, but there is no danger of a dull José - it is not just our voracious appetite for Cuban salsa and music that has him opening the first Cuban Embassy in our country – he also intends to share Cuban art with us, in addition to some 40 subtitled films he brought with him! Once this show gets on the road Cuba may lose a few tourists – why leave town when you can see his country right here – especially when, as he appreciatively pointed out, we already live in one of most beautiful cities in the world!! Salud, Senor Robaina Garcia - y Bienvenidos! Webb-Pullman has close ties to Senor Robaina Garcia. Webb-Pullman spent much of 2005 in Havana, Cuba, where she supported herself by editing and writing propaganda for Prensa Latina-the Cuban state news agency. In 2006 Webb-Pullman spent most of her time flitting between Cuba and Mexico. Much of her time was spent in the southern state of Oaxa covering the anarchist inspired rioting that resulted in several deaths. Webb-Pullman filed a photo-essay for the Australian Democratic Socialist Party's Green Left Weekly on the troubles. Mainly however Webb-Pullman was interested in the Zapatista rebels of Chiapas state. 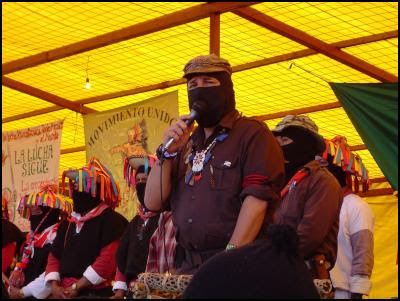 At the beginning of January 2007 Webb-Pullman attended a several thousand strong Zapatista gathering or "encuentro" in Oventik, Chiapas. In August 2007 she covered the Second Zapatista Intergalactica-a huge international gathering of anarchists and indigenous revolutionaries. Webb-Pullman returned to New Zealand just in time for the October 15th 2007 anti terror raids. As the news of the 17 arrests broke, Webb-Pullman began churning out articles in defence of her arrested comrades. Several of those jailed were active in the Wellington Zapatista Support Group-an organisation Webb-Pullman is herself heavily involved in. Webb-Pullman used her Cuban honed propaganda skills to defend her comrades against the oppressive New Zealand state. After all they were the closest thing New Zealand has to a real Zapatista army. Thanks for enlightening us on this Far-Left fanatic with a double-barrel name. As for Scoop, I wonder how many businesses and organisations know of its extremist views. They may be surprised, especially if they supply it with releases that provide its bread and butter, or even use its information. Why aren't the mainstream media picking up on this(apparently apart from the Dominionpost in Wellington and the Christchurch Press). No wonder people are swinging from the mainstream media to the web! Well done Trev! You are correct, unlike the previous photo you published that you thought was me but wasn't, and the various other photos who weren't who you said they were, and the people you say are anarchists who aren't, and your assumtions that you don't check and aren't true, this time you've got something right - I am an anarchist and that is me talking to Keith Locke! Pour yourself a beer this evening, you deserve it! Leftist-anarchist-green stirrers believe it's morally okay to tell porkies, so I now wonder whether it really was "Sam Buchanan" in the picture. Worry not, Mr Loudon, your accuracy is superb compared with the whoppers the Melon Greens, Dark Greens, and plain Red Idiots are putting around about the Urewera nutters. I'm not entirely sure you understand the fact that the Zapatistas and EZLN are a non-violent guerilla movement. Can you speak Spanish? If not, unfortunately much of the material written in English (of the sort that I'd imagine you'd be drawn to on right-wing blog sites) is very misleading about the nature of the Zapatista uprising. I think you'd find that the Zapatistas, just like you as a younger man in the 1980s with your idealistic support of anti-revolutionary forces in Apartheid South Africa and your dedicated belief that we ought to keep sporting links with racist nations but not communist ones, had a vision and a goal that was impractical upon it's launch, but was one that was fought through conviction and a strong sense of belief. What is it with Zapatistas and masks, and what have they go to do with New Zealand? Why are the Greens so interested? Do they grow marijuana in that part of Mexico? "Leftist-anarchist-green stirrers believe it's morally okay to tell porkies..."
Excellent! Another dyed-in-the-wool collectivist turns up on Trev's 'Libertarian' site. All anarchists, leftists and greens think the same apparently (and in the context of this site, 'leftist' seems to mean the vast majority of the New Zealand population), thus anybody who doesn't support the absolute sanctity of private property is cobbled together with Stalin. May I suggest repeating to yourselves "human beings are all individuals and have differing thoughts and opinions" three times before going to bed every night? After a few years the truth of this might sink in. "your accuracy is superb compared with the whoppers the Melon Greens, Dark Greens, and plain Red Idiots are putting around about the Urewera nutters." Golly. An anonymous writer gives Trev credit for being more accurate than somebody they claim are a pack of liars. High praise indeed! Pass the ketchup.